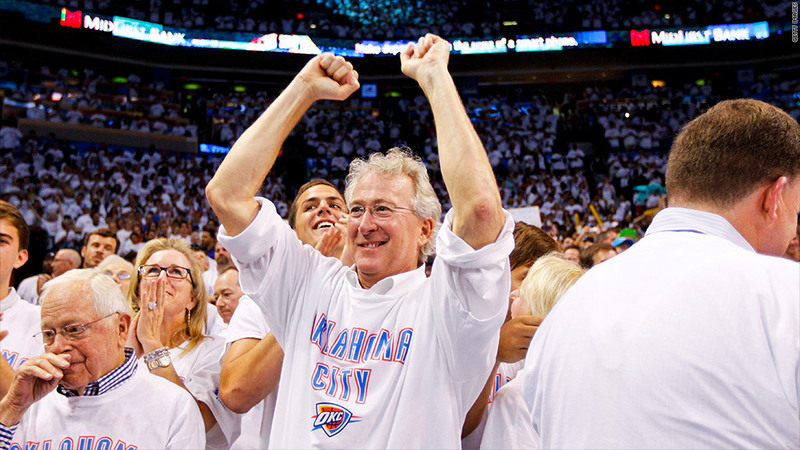 Aubrey McClendon, outgoing CEO of Chesapeake Energy, is part-owner of the Oklahoma City Thunder basketball team. Chesapeake Energy announced Tuesday that embattled CEO and co-founder Aubrey McClendon will retire from the company in April. The Oklahoma-based firm faced scrutiny last year after Reuters reported that McClendon had taken out more than $1 billion in loans against his personal stakes in the company's wells. Chesapeake subsequently revealed that it was the subject of an inquiry from the Securities and Exchange Commission, and announced that the program through which McClendon acquired his stakes would be ended early. In a statement released after the closing bell Tuesday, Chesapeake's board praised McClendon's "strong leadership" and said an "extensive review" of his alleged conflicts of interest had yet to uncover any improper conduct. The firm, America's second-largest natural gas producer, said its "decision to commence a search for a new leader is not related to the Board's pending review of [McClendon's] financing arrangements and other matters." Chesapeake (CHK) shares surged on the news in after-hours trading, gaining 10%. McClendon has served as Chesapeake's CEO since the company's inception in 1989, when it had just 10 employees compared to the 12,000 it boasts today. He was also chairman until last year, when shareholders forced the firm to overhaul its board and appoint an independent chairman. "[A]s the company moves towards more fully developing the value of its outstanding assets, Chesapeake is at an important transition in its history and Aubrey and the Board of Directors have agreed that the time has come for the company to select a new leader," Chesapeake chairman Archie Dunham said in the company's statement Tuesday. McClendon said in the statement that he had "certain philosophical differences with the new Board," but that he was looking forward "to working collaboratively with the company and the Board to provide a smooth transition to new leadership for the company." McClendon, 53, is a part-owner of the Oklahoma City Thunder basketball team, whose arena bears Chesapeake's name. He will retire from Chesapeake on April 1, and will step down from his position as CEO once a successor is appointed, the firm said. The results of Chesapeake's review of McClendon's financing arrangements will be released when the company reports its quarterly earnings on February 21.